Casserole chicken is one of many traditional French chicken recipes you can prepare at home. 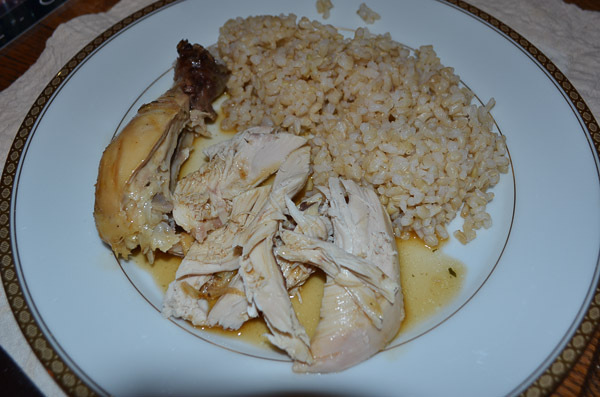 Chicken is a staple in traditional French cooking. In the region of Brittany for example the sea air, and humidity contribute to breeding top quality birds. 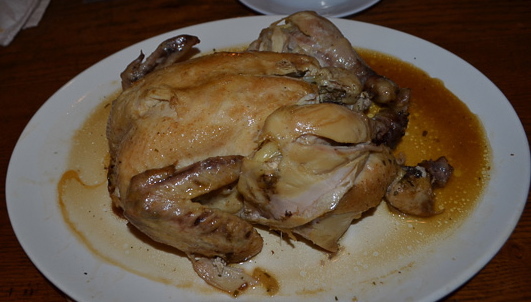 One particular bird is called poulet blac breton (white Breton chicken) . So you may not be in Brittany but you should try to get the best quality bird for the best flavor. For this casserole chicken I used an organic bird which to me tastes the best. Many chicken breeders in France, a few weeks before killing let their chickens run free in the meadows. The Rhône Alps Region is famous for its Bresse Chicken. 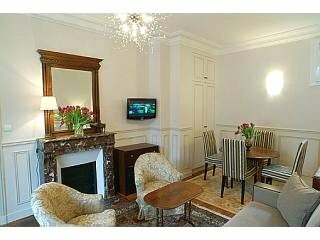 Serving traditional French food at home is a wonderful way to bring the culture of France into your family's life. 1. Gather all your ingredients, slice onions and carrots and set aside. 2. Season cavity of chicken with 1/4 tsp salt, pepper and 1 Tb butter. Insert 3 - 4 sprigs tarragon or 1/2 tsp dried. 3. *Truss the chicken. Dry it and rub skin with 1 Tb butter. Preheat oven to 325 degrees. 4. Put casserole over medium high heat add 2 Tb butter and 1 Tb oil. When butter stops foaming, brown chicken, breast down for 2 -3 minutes. Make sure butter doesn't burn, turn down heat if necessary. Turn chicken on the other side. Try to brown on all sides so it's nice and golden looking. Total time 10-15 min. 5. Set chicken aside. Pour out fat if it's burned and add 3 Tbs butter. 6. 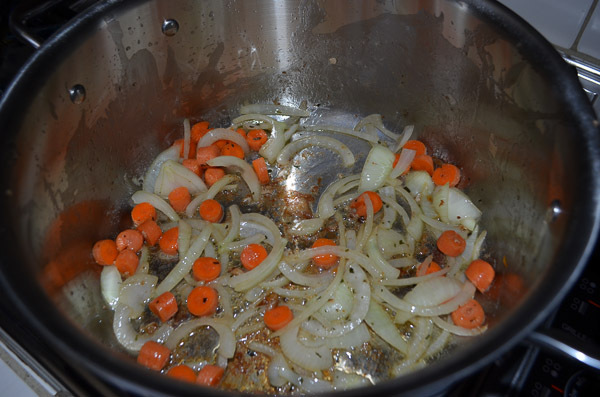 Cook carrots and onions slowly in the fat slowly for 5 minutes. Do not brown. Add the remaining tarragon. 7. Sprinkle 1/4 tsp salt evenly over chicken. Set breast side up over the vegetables and **baste with the fat from the casserole. Lay a piece of aluminum foil over the chicken, cover the casserole and reheat over the stove until you hear the chicken sizzle. Then put casserole in the middle rack of the oven. 8. Roast 1 hour and 10 - 20 minutes. ** Baste once or twice with the butter and juices from the casserole. 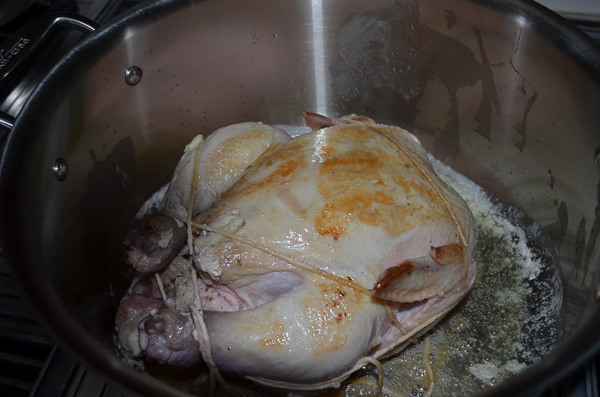 The chicken is done when the drumsticks move in the sockets and the juices run clear. 9. Remove chicken to a serving platter and get rid of trussing strings. ** I didn't baste and it turned out delicious. 1. 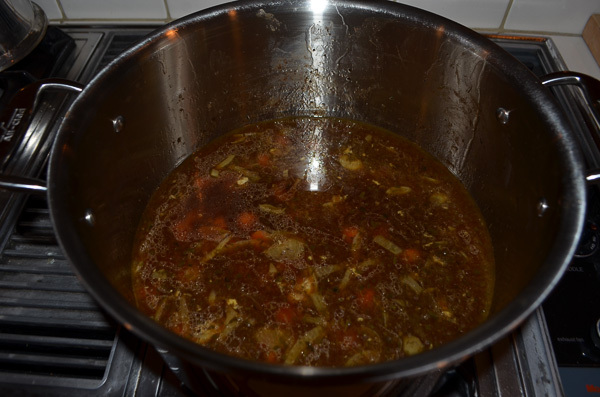 Add the stock to the casserole and simmer for 2 minutes scraping up the bits from the pot. 2. Skim off all but 1 Tb fat. 3. Blend in cornstarch mixture and simmer 1 minute. Then raise heat and boil until the sauce is slightly thickened. Taste, add more tarragon you want. 4. Strain into a warmed bowl and stir in herbs and butter. Pour a spoonful of sauce over the chicken and decorate with tarragon leaves. If you have company you might want peas or green beans to balance the colors on the plate.